As Lily is such a huge fan of animals, we just love to collect the Schleich animals. So when we got offered some beautiful pintabain horse to review, we were really happy to say yes and add them to our collection. We were sent 2 horses, one was a stallion and one was a mare. We also got sent some foal care accessories. The detail of the horses are so lovely. They are all hand painted really nicely and they really don't miss a thing, from the bows in the mare's hair to the lovely patterns on their bodies, to the detail on the hooves. You can tell a lot of work has been put into these to provide the most elegant and beautiful horses. They look just like the horses children will have seen in fields before or maybe like a horse that they own. I think that the horses are both so lovely with the fact they have different stances with how they stand. 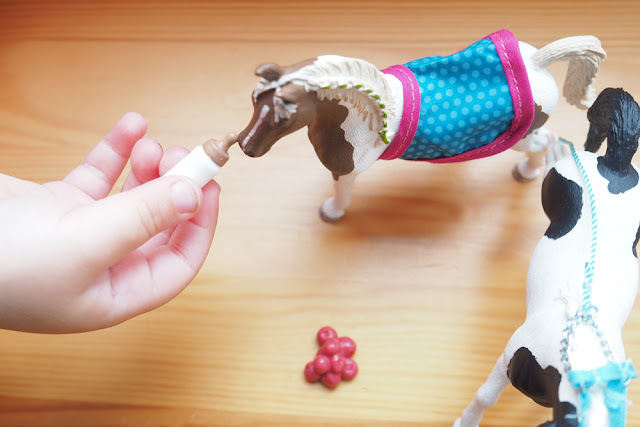 It really helps with children's imaginations to be able to play out different things with the horses looking different to each other. The quality of these toys are amazing. Really strong and sturdy. They look like they would last a long time. The accessories that come in the pack are great. Perfect for caring for your horse. Lily loved that you could put the blanket on its back and the harness on its mouth. Though not 100% how it goes on. I have never really been around horses to know. 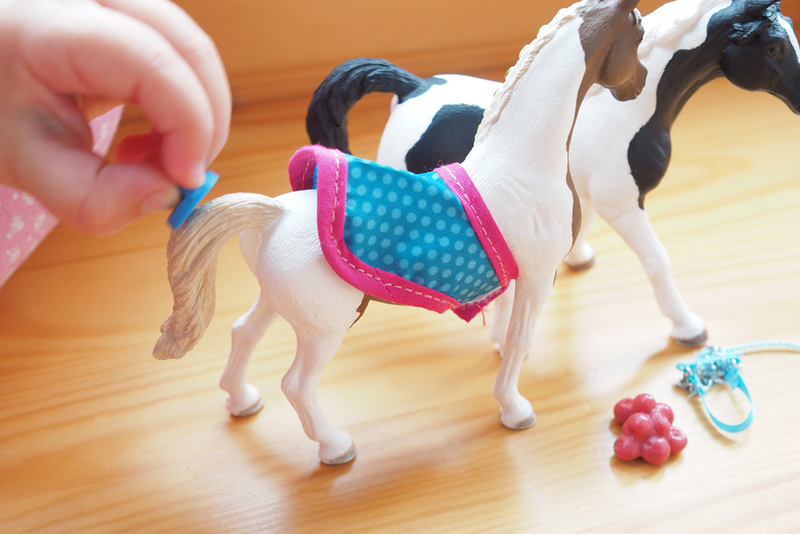 The set is really colourful, especially the blanket which goes around the horse and attaches with velcro. Lily really loved playing with them. She would feed them the apples, brush their hair with the little brushes, and feed them the bottle of milk. The set is meant to be for a foal, but it works just as well if you only have horses. You can buy the horses for £6.49 and you can also buy a foal which is £4.49. They are both recommended for ages 3+. The accessory pack is £3.49 and recommended for no younger than 3 due to small parts. I let Lily play with these but I was supervising her at all times. You can check out the whole range on the Schleich website. 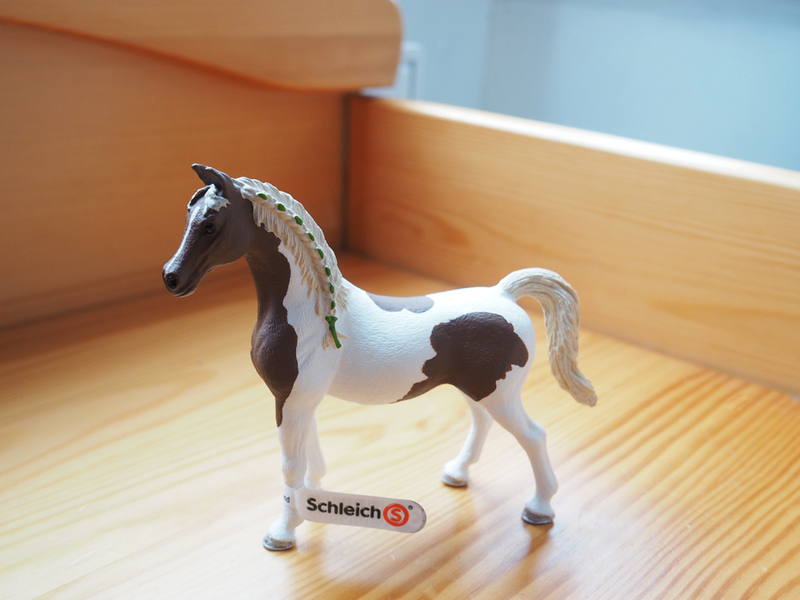 What do you think to the quality of Schleich toys? 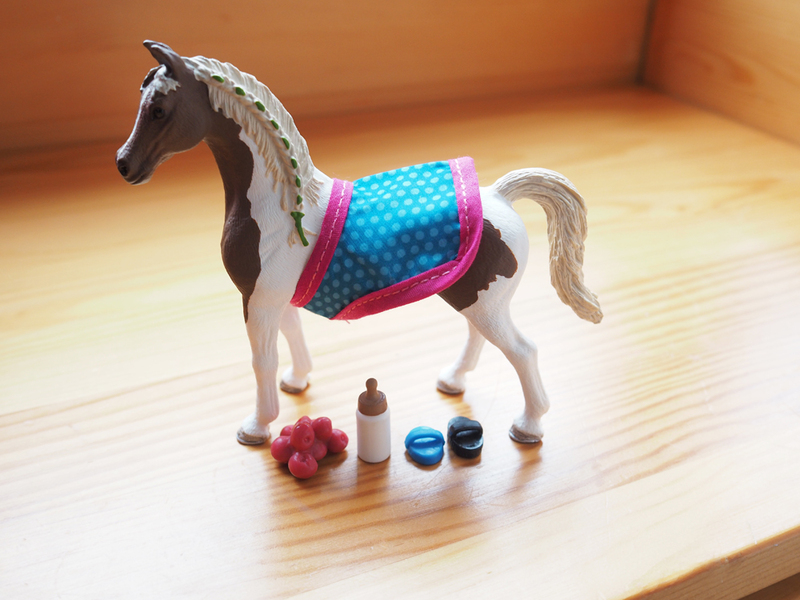 Would your child love to own a toy horse of their own? Those look so nice. I really like the accessory set, even though my daughter would probably lose it all. 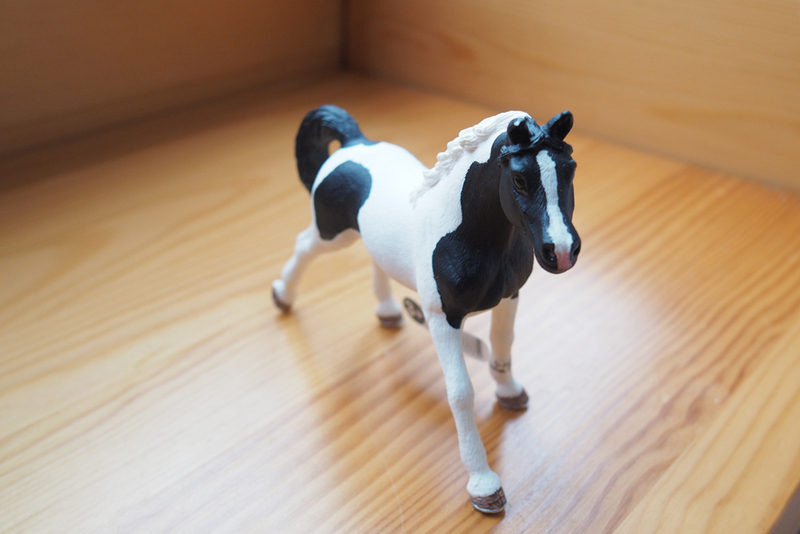 I love Schleich animals, they are so well made, these horses are lovely. I've always really trusted this brand. 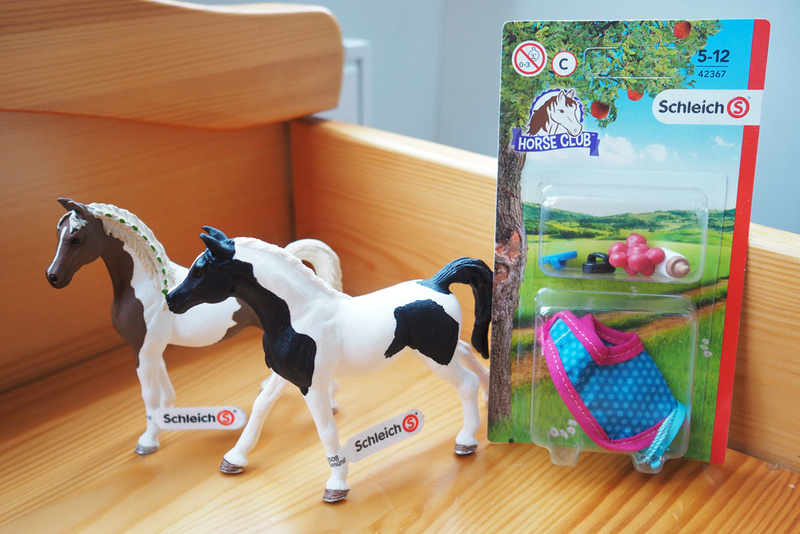 I love Schleich as all their toys are anatomically correct and beautifully made.